Much of the helpful reporting has come from the alternative media, such as The Intercept, Unicorn Riot and DeSmog Blog, which have limited budgets. These issues deserve the kind of probing and analysis that only Congress can provide. Getting clarity on the role TigerSwan played in shaping law enforcement’s DAPL intervention, particularly as it relates to the National Sheriffs’ Association. TigerSwan provides full-spectrum, asymmetric solutions to allow your business to operate safely in today’s global environment and provide you a strategic advantage – a global presence. We are available around the clock and around the globe to provide you global stability. According to Unicorn Riot, Delta Force veteran Jim Reese founded TigerSwan. He had worked doing counter-terrorism work in Afghanistan for the State Department, and formerly advised Blackwater, the disgraced security firm that worked for the United States in Iraq. A story in The Interept said TigerSwan is largely made up of special operations military veterans and was formed during the Iraq War. 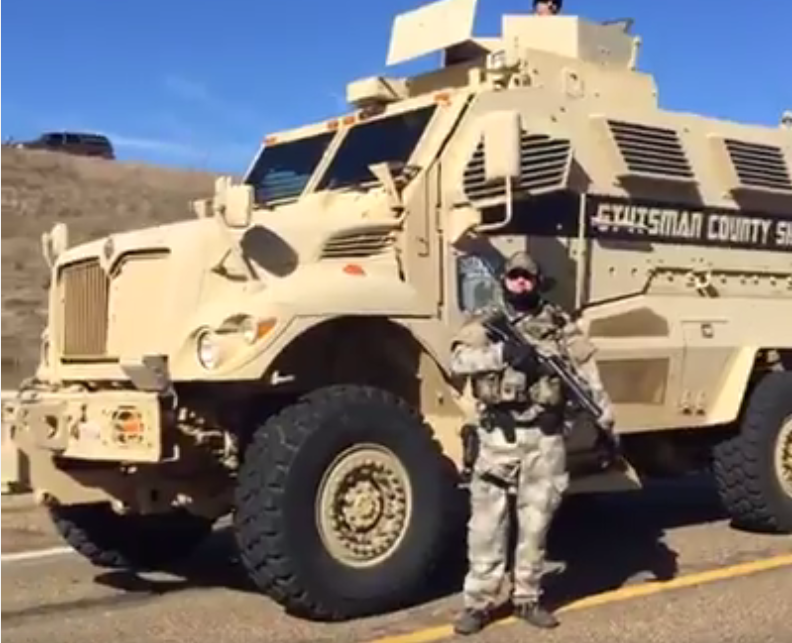 So this was the private security force that Energy Transfer Partners hired to work on its behalf in North Dakota. It’s a bit cliche, but when you’re a hammer, every problem looks like a nail. TigerSwan’s worldview is to see terrorists. I believe its “anti-terrorism” approach unnecessarily escalated the DAPL conflict. The cozy relationship between TigerSwan, law enforcement agencies, the National Sheriff’s Association, and the Peace Garden State’s politicians with the oil and gas industry suggests a partnership that threatens free speech, human rights, and the very basis of democracy. Did TigerSwan (and therefore Energy Transfer Partners corporate interests) have undue influence on the National Sheriffs’ Association and other law enforcement agencies in their response to DAPL. Did that influence drive the highly militarized response, resulting in unnecessary conflict and injury? Whether private security firms such as TigerSwan should be able to lobby and influence law enforcement groups by giving major donations. Where is the check on this kind of influence? 2. The National Sheriffs’ Association was involved in opposition research and a misinformation campaign against the water protectors. It seems to go beyond any peace keeping role to the point of taking sides. Delve is an opposition research firm led by Jeff Berkowitz, a former Republican National Committee research director. Off the Record Strategies is led by Mark Pfeifle, who previously led PR efforts for the wars in Iraq and Afghanistan for the George W. Bush administration. One troubling piece from the article is an excerpt from an email by Jonathan Thompson, the executive director of the National Sheriffs’ Association, about a planned October press conference on DAPL. The extent that the National Sheriffs’ Association and other law enforcement agencies engaged in PR campaigns to discredit and dehumanize individuals and/or groups. These tactics seem far afield from the “police education, police training, and general law enforcement information resources” the Association describes on its website. At what point law enforcement crosses over from providing needed public information into politics, propaganda, and preferential treatment? What are the remedies when this happens to restore public confidence in law enforcement? 3. Law enforcement surveillance and other tactics escalated the tension and the violence. There has to be a better way. Much as been written about the highly militarized approach, the attack dogs, the water cannons in freezing temperatures, the list goes on. Law enforcement also used sleep deprivation techniques against the water protectors. At night, law enforcement shone lights on the camp and flew helicopters overhead. If people are sleep deprived, they will not think clearly and will be more on edge. There also were reports of DAPL supporters used provocateurs inside the camps. They were apparently present but the extent is unknown. These are destabilizing tactics that escalate violence. What was the rationale for the various tactics they chose to use against the water protectors? They must have known these tactics would provoke violence. Was the intention to provoke more violence, and if so, why? Was this part of the public relations strategy to stress out the water protectors so they would act in a way to put them in a bad light? How do they justify these anti-terror tactics on U.S. citizens? What efforts were made at dialogue and what worked and did not work? In closing, I want to point out that the National Sheriff’s Associations seems to have a very narrow understanding and little empathy for Native American communities and the historic trauma they have suffered. If that doesn’t change, these conflicts will continue. I certainly feel empathy for the Native American peoples of America and especially the Sioux due to the treatment they received at the hands of the U.S. Government in the latter part of the 19th Century. What is significant here is that Champagne seems to believe that the government’s ill treatment of Native peoples is confined to the late 19th Century. This narrow view of history is not unique to Champagne, but he is in a position where carrying that worldview can have a profound and negative impact. Many of us have been taught to believe that the trauma suffered by Native Americans is something that happened in the past. There is much about colonialism and its ongoing impacts on Native communities today that all of us need to be honest about. Boarding school policies continued well into the 20th Century, intentionally destroying Native American families. They separated parents from children, destroyed traditional ways of learning parenting skills, and tried to destroy Native languages and customs. Native Americans were not able to freely practice their religions until the American Indian Religious Freedom Act of 1978, something most of us have always taken for granted. Even small things like efforts to stop the use of insulting Washington Reds*ins logo become a huge deal, and often are derided. The original DAPL route was near Bismarck. That got changed because people didn’t want to go near Bismarck’s water. But because there are fewer Lakota, it’s apparently OK to put DAPL near Standing Rock. It reinforces a long, long narrative that Native American lives matter less than white lives. There are numerous reasons that Native Americans do not (and should not) trust the system that repeatedly failed to protect their interests. If law enforcement staff and leaders don’t understand the historic and ongoing context, they will not be able to engage with Native communities in a meaningful way. Empathy and understanding do matter. Of the issues I have raised, this last is the most difficult to address and the one that has the possibility of bringing long-term change. It falls on local law enforcement to improve their training and community building. Perhaps Congress’ role here is simply providing resources to help make it happen in communities committed to this work. P.S. An April story in Unicorn Riot notes: “In the aftermath of Standing Rock, the Sheriffs’ Association has remained active on pipelines owned by Energy Transfer Partners, including its proposed Bayou Bridge pipeline through Louisiana.” The project even received a letter of support from the National Sheriffs’ Association, according to project publicity. The National Sheriffs’ Association President Champagne oversees St. Charles Parish in Louisiana, (at the end of the line for Bayou Bridge), according to the story.